There are flights to destinations that include Bangkok, Delhi, Kolkata, Bagdogra, Bodh Gaya, Dhaka, Kathmandu, Guwahati and Singapore. Paro is situated at a height of 2,225 m (7300 ft) above sea level and is surrounded by mountains as high as 4,876 m (16,000 ft). 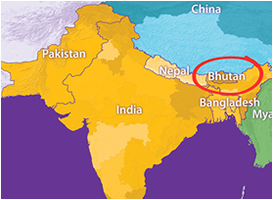 At present two carriers operate to Bhutan, Drukair and Bhutan Airlines. And there are domestic airports in Yonphula in eastern Bhutan, Bumthang in central Bhutan, and Gelephu in south-central Bhutan. Flying into Bhutan’s Paro International Airport is typically an exciting experience as the descent into Paro valley brings you closer to the mountain tops than most other flights in the world. The flight between Paro and Kathmandu is one of the most exciting ones as the aircraft passes over four of the five highest mountains in the world. In fine weather, as you soar higher up, you can enjoy the spectacular view of Mt. Everest, Lhotse, Makalu and Kanchenjunga at their best.